The trailer to Rainbow Skies had me interested, and worried – a game that offers so many activities. Exploration, tactical combat, monster taming, fishing, treasure hunting… It’s good to always have things to do in a game, but doing half a dozen things adequately will never match up to doing one thing well. The worry was there – what does Rainbow Skies do well? The answer to that is to metricate all of the other things. 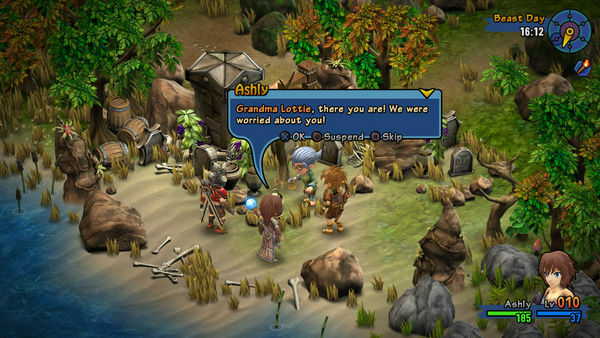 A sequel to 2012′s Rainbow Moon, Rainbow Skies was originally meant for release in 2014 but has only just made it here. It is at heart a JRPG, with a large world to explore and a tactical combat system to deal with the monsters you encounter everywhere. Playing as Damion – a hot-headed, spiky haired boy whose confidence exceeds his abilities; basically, a Naruto-esque figure – and his friend/rival/mentor Layne, the game begins with their monster hunting exam going wrong and leads to them falling from their floating hometown. However, they are accidentally saved by trainee wizard Ashly’s binding spell… which also traps the three of them together, leading to journeys across the world seeking experts who might be able to help reverse it. So far, so good. Combat is handled in a turn-based, tactical layout, and it’s a shame there is so little in the way of tactics. Because for the first hour, combat was fun, thanks to quick encounters between two characters and small groups of critters. However, by the fifth hour, I was skipping the random ambushes – thankfully ignorable if you’re not in the mood for them – as it was starting to drag. By the tenth hour, I realised I was actively avoiding the non-random battles if I could, those groups of enemies stationed on the map to gate entry into new areas. For a game based around levelling through combat, this is a big issue. Every combatant has a certain number of moves they can make when it is their turn – taking a step, attacking, drinking a potion, using a skill, and so on. 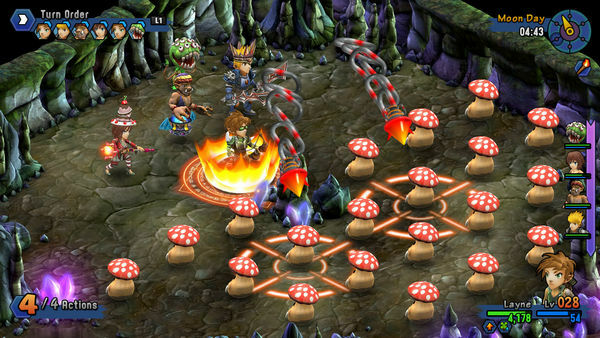 Tactically, however, it eventually comes down to trying to limit how many enemies can attack you at once, trying to gang up on enemies, and hoping that defeated enemies drop treasure – not just for the post-fight gains, but because the bag of loot fills the space to prevent other enemies moving there. There are a lot of elements trying to add a more tactical layer to combat, such as spells and items to buff and debuff, and certain weapon types being more effective against certain enemy types. But combat is either against enemies so weak it’s over too fast, or against enemies so strong that you’ll be doing all you can to defeat them before their incoming damage empties out your supply of health potions. There’s no flow to combat which leaves a lot of skills too situational to be useful, which is a shame as the skill levelling system – repeatedly use a skill to improve its effectiveness – is a good idea. All enemies have skills they can use on you too; all good and fair. Some of these skills have mini-cut scenes when they activate them though, which gets tiring after being seen repeatedly. When combat has become grind, and large numbers of tough enemies require focused effort to clear over several minutes, seeing a series of identical cut scenes taking several seconds each was not desirable. After a certain point in the game – approximately 8 or so hours in – you gain the ability to raise monsters of your own, with enemies having the chance to drop eggs after defeating a certain number of them. Incubate this in town, wait (measured by a certain number of fights), and you can add the new critter to the team as an extra member… and often arriving in better fighting form than the heroes you’ve been levelling and upgrading for all the hours until now. It’s a nice idea, though, as is being able to make the new monster team leader – and so roam the world as the creature itself. Everywhere you go, there is something to do. It’s not just about fighting monsters, though it usually ends up with that. Exploring is also encouraged, with percentage bars filling as you wander around each area, and the automap showing how many hidden treasures there are to find. Sounds good, and seeing an area as cleared is satisfying, but usually the hidden items are coins (also gained from combat), potions or food… and inventory space is tight, regularly leaving you having to immediately use items rather than keep them for later. Oh, and regarding those items… As mentioned at the beginning, the game measures pretty much everything you do – and this is probably its greatest strength. It’ll let you know if an item is something you’ve not encountered before, and gives an idea of how many more things there are in the world. Similarly, fight a type of monster enough times and you’ll unlock its stats to check; complete a quest and see how far into the game you are, what there still is to do, and even what categories these come under; and for that matter, see the highest level of damage you’ve done, or how long you’ve wandered around with a light source, and a glut of other random figures that are curiously motivating when you want to know what to be working on next. Basically, the game is designed to reward completionists; but doesn’t offer the greatest of experiences to complete. It’s a shame – the game look bright and colourful, the sense of having an open world to explore is great, but the game lacks any one thing to do that feels like a hook to keep you playing; and some elements – the combat, for example – feel so underwhelming as to be avoided. It is sadly an example of the quantity of content replacing the quality. 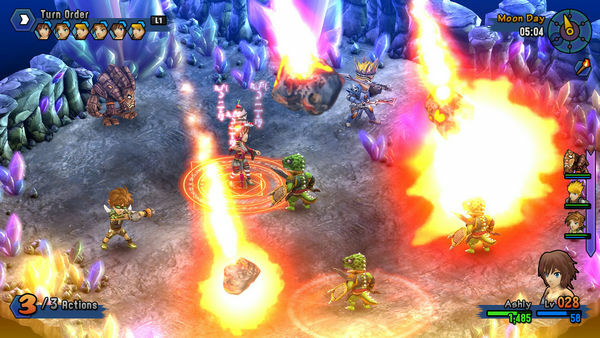 Rainbow Skies is released today in Europe (yesterday in the US), and is available as a cross-purchase on PS3, PS4 and Vita. There is also the option to cloud save and continue playing on different platforms too.